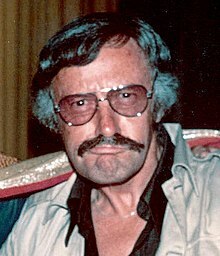 Stan Lee (born Stanley Martin Lieber /ˈliːbər/; December 28, 1922 – November 12, 2018) was an American comic book writer, editor, and publisher. Lee was known for being Marvel Comics' lead creative leader for twenty years. With his work alongside co-writer/artists Jack Kirby and Steve Ditko, he co-created many popular fictional characters, including superheroes Spider-Man, the X-Men, Iron Man, Thor, the Hulk, the Fantastic Four, Black Panther, Daredevil, Doctor Strange, and Ant-Man. Following his retirement from Marvel in the 1990s, he remained a public figurehead for the company, and made cameo appearances in movies based on Marvel characters. Meanwhile, he continued independent creative works into his 1990s, until his death in 2018. Lee was added into the comic book industry's Will Eisner Award Hall of Fame in 1994 and the Jack Kirby Hall of Fame in 1995. He received the NEA's National Medal of Arts in 2008 from President George W. Bush. Lee was born on December 28, 1922, in Manhattan, New York City, in the apartment of his Romanian-born Jewish immigrant parents. His parents were Celia (née Solomon) and Jack Lieber, at the corner of West 98th Street and West End Avenue. His father, trained as a dress cutter, worked only sporadically after the Great Depression, His family moved further uptown in Manhattan, in Washington Heights, Manhattan. Lee had one younger brother named Larry Lieber. At an early age, Lee was inspired by books and movies, especially those with Errol Flynn playing heroic roles. By the time Lee was in his teens, the family was living in an apartment in The Bronx. Lee described it as "a third-floor apartment facing out back". Lee and his brother shared the bedroom, while their parents slept on a foldout couch. Lee attended DeWitt Clinton High School in the Bronx. He enjoyed writing, and had dreams of one day writing the "Great American Novel". He said that in his youth he worked such part-time jobs as writing obituaries for newspapers for the National Tuberculosis Center. He delivered sandwiches for the Jack May pharmacy to offices in Rockefeller Center, worked at the Rivoli Theater on Broadway, and sold subscriptions to the New York Herald Tribune newspaper. He graduated from high school early in 1939 and joined the WPA Federal Theatre Project. With the help of his uncle Robbie Solomon, Lee became an assistant in 1939 at the new Timely Comics division of pulp magazine and comic-book publisher Martin Goodman's company. By the 1960s, they would evolve into Marvel Comics. His first role in the comics were, as Lee described in 2009: "In those days [the artists] dipped the pen in ink, [so] I had to make sure the inkwells were filled...I went down and got them their lunch, I did proofreading, I erased the pencils from the finished pages for them". Lee made his comic-book debut with the text filler "Captain America Foils the Traitor's Revenge" in Captain America Comics #3 (May 1941). This is where he first used the pseudonym Stan Lee, which years later he would become his legal name. Lee later explained that he was so embarrassed that he used a pen name so that nobody would associate his real name with comics when he some day wrote the Great American Novel. Lee's first superhero co-creation was the Destroyer, in Mystic Comics #6 (August 1941). Other characters he co-created during this period was called the Golden Age of Comic Books include Jack Frost and Father Time. In 1941, Lee, just under 19 years old, became interim editor. :14 He soon became the comic-book division's editor-in-chief, as well as art director for much of that time, until 1972, when he became publisher. Lee entered the United States Army in early 1942. He was a member of the Signal Corps, repairing telegraph poles and other communications equipment. He was later transferred to the Training Film Division, where he worked writing manuals, training movies, slogans, and cartooning. The army called Lee a "playwright", making him one of the nine men in the U.S. Army were given that title. Lee returned from his World War II military service in 1945. In the mid-1950s, the company was known as Atlas Comics, Lee wrote stories of many genres including romance, Westerns, humor, science fiction, medieval adventure, horror and suspense. By the end of the decade, Lee was not happy with his career and thought about quitting the field. In the late 1950s, DC Comics created the Justice League making comic book superheros more popular. In response, publisher Lee was hired to come up with a new superhero team. Lee's wife, Joan, said that he experiment with stories he liked, since he was planning on changing careers and had nothing to lose. Lee followed his wife's advice and created a set of heroes with character flaws because many heroes before were seen as nearly perfect beings. The first superheroes Lee and artist Jack Kirby created together were the Fantastic Four. They became popular which led Lee and Marvel's illustrators to create new heroes. Again working with Kirby, Lee co-created the Hulk, Thor, Iron Man, and the X-Men; with Bill Everett, Daredevil; and with Steve Ditko, Doctor Strange and Marvel's most successful character, Spider-Man. As a result, Lee created a shared universe between the fictional heroes. Lee and Kirby combined several of their newly created characters together into the team title The Avengers. Lee's revolution extended beyond the characters and storylines to the way in which comic books engaged the readership and built a sense of community between fans and creators. He introduced the practice of regularly including a credit panel on the splash page of each story, naming not just the writer and penciller but also the inker and letterer. Regular news about Marvel staff members and upcoming storylines was presented on the Bullpen Bulletins page, which (like the letter columns that appeared in each title) was written in a friendly, chatty style. Lee remarked that his goal was for fans to think of the comics creators as friends, and considered it a mark of his success on this front that, at a time when letters to other comics publishers were typically addressed "Dear Editor", letters to Marvel addressed the creators by first name (e.g. "Dear Stan and Jack"). In the 1960s, Lee wrote, drew and edited most of Marvel's series and wrote a monthly column called "Stan's Soapbox". He wrote endless promotional copy, often signing off with his trademark motto, "Excelsior!". Lee would brainstorm a story with the artist and then prepare a short synopsis rather than a full script. Based on the synopsis, the artist would fill the number of pages left by determining and drawing the panel-to-panel storytelling. After Ditko's left Marvel in 1966, John Romita Sr. became Lee's collaborator on The Amazing Spider-Man. Within a year, it overtook Fantastic Four to become the company's top seller. Lee and Romita's stories focused as much on the social and college lives of the characters as they did on Spider-Man's adventures. The stories talked about issues at the time such as the Vietnam War, political elections, and student activism. Lee created the Black Panther, an African king who would be mainstream comics' first black superhero. Lee and artist John Buscema created The Silver Surfer series in August 1968. The following year, Lee and Gene Colan created the Falcon, comics' first African-American superhero in Captain America #117 (September 1969). Then in 1971, Lee helped change the Comics Code. The U. S. Department of Health, Education and Welfare had asked Lee to write a comic-book story about the dangers of drugs. As a result, Lee created a three-issue story in The Amazing Spider-Man #96–98 (cover-dated May–July 1971), in which Peter Parker's best friend becomes addicted to prescription drugs. The Comics Code Authority did not approve of this because the stories depicted drug use. However, Lee had the story published without the seal of approval from the authority. The comics sold well and Marvel had positive reviews for its focus on mature social issues. Lee supported using comic books to criticize social events about the real world, often talking about racism and bigotry. In 1972, Lee stopped writing monthly comic books to become publisher. His final issue of The Amazing Spider-Man was #110 (July 1972) and his last Fantastic Four was #125 (August 1972). Lee became a public face for Marvel Comics. He made appearances at comic book conventions around America, teaching at colleges and participating in panel discussions. Lee created the Spider-Man newspaper comic strip on January 3, 1977. Lee's final work with Jack Kirby, The Silver Surfer: The Ultimate Cosmic Experience, was published in 1978. Lee and John Buscema produced the first issue of The Savage She-Hulk (February 1980). Lee moved to California in 1981 to work on Marvel's television and movie properties. Lee was briefly president of the entire company, but soon stepped down to become publisher instead. Lee said that being president of the company was too much about numbers and finance and not enough about the creative process he enjoyed. Lee stepped away from regular duties at Marvel in the 1990s. He continued to receive an annual salary of $1 million as Chairman Emeritus. 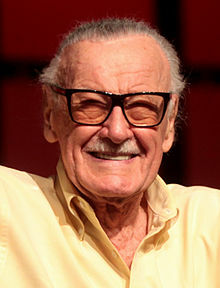 In 1998 he and Peter Paul began a new Internet-based superhero creation, production, and marketing studio, Stan Lee Media. After legal issues, Stan Lee Media filed for bankruptcy in February 2001. Following the success of Fox Studio's 2000 X-Men movie and Sony's then-current Spider-Man movie, Lee sued Marvel in 2002. He sued company because he believed they failed to pay him the 10% he was due under the terms of his contract for movies featuring the characters he had co-created. They settled in 2005 for an unknown amount of money. At the 2012 San Diego Comic-Con International, Lee announced his YouTube channel, Stan Lee's World of Heroes, which airs programs created by Lee, Mark Hamill, Peter David, Adrianne Curry and Bonnie Burton, among others. Lee wrote the book Zodiac, released in January 2015, with Stuart Moore. At the 2016 Comic-Con International, Lee introduced his digital graphic novel Stan Lee's God Woke. The print-book version won the 2017 Independent Publisher Book Awards' Outstanding Books of the Year Independent Voice Award. Lee was an executive producer on most Marvel movie and television shows beginning with the 1990 direct-to-video Captain America movie. He had cameo appearances in many Marvel movies and television shows, especially those within the Marvel Cinematic Universe. In a 2002, survey of whether he believed in God, he said: "Well, let me put it this way... [Pauses.] No, I'm not going to try to be clever. I really don't know. I just don't know". From 1945 to 1947, Lee lived in Manhattan. He married Joan Clayton Boocock on December 5, 1947, and in 1949, the couple bought a house on Long Island, living there through 1952. Their daughter Joan Celia "J. C." Lee was born in 1950. Another child, daughter Jan Lee, died three days after delivery in 1953. Lee lived in the Long Island town of Hewlett Harbor, New York, from 1952 to 1980. They also owned a condominium in Manhattan from 1975 to 1980. He moved in Los Angeles in 1981, they bought a home in West Hollywood, California. In September 2012, Lee had surgery to add a pacemaker. On July 6, 2017, his wife of 69 years, Joan, died of complications from a stroke, aged 95. In April 2018, The Hollywood Reporter said that Lee was a victim of elder abuse. Lee died at the age of 95 at Cedars-Sinai Medical Center in Los Angeles, California, on November 12, 2018. The cause was respiratory and congestive heart failure. Earlier that year, Lee publicly said that he had pneumonia in February and was rushed to the hospital for worsening conditions at around the same time. Ro, Ronin (2005) [first published 2004]. Tales to Astonish: Jack Kirby, Stan Lee, and the American Comic Book Revolution. Bloomsbury Publishing. ISBN 978-1-58234-566-6. ↑ Miller, John Jackson (June 10, 2005). "Comics Industry Birthdays". Comics Buyer's Guide. Iola, Wisconsin. Archived from the original on October 30, 2010. ↑ The Celebrity Who's Who – World Almanac. Google Books. September 1986. p. 213. ISBN 978-0-345-33990-4. Retrieved August 13, 2013. ↑ Lewine, Edward (September 4, 2007). "Sketching Out His Past: Image 1". The New York Times Key Magazine. Archived from the original on April 24, 2009. Retrieved April 27, 2010. ↑ 5.0 5.1 5.2 Lewine. "Image 2". Archived from the original on April 24, 2009. Retrieved April 27, 2010. ↑ 6.0 6.1 Kugel, Allison (March 13, 2006). "Stan Lee: From Marvel Comics Genius to Purveyor of Wonder with POW! Entertainment". PR.com. Archived from the original on June 11, 2011. Retrieved May 28, 2011. ↑ Sedlmeier, Cory (ed.). Marvel Masterworks: The Incredible Hulk Volume 2. Marvel Comics. p. 244. ISBN 978-0-7851-5883-7. ↑ "Biography". StanLeeWeb.com (fan site by minority shareholders of POW! Entertainment). Archived from the original on October 24, 2008. Retrieved April 27, 2010. ↑ Apuzzo, Jason (February 1, 2012). "With Great Power: A Conversation with Stan Lee at Slamdance 2012". Moviefone. Archived from the original on September 7, 2013. ↑ "Stan Lee". WebOfStories. Retrieved September 15, 2015. ↑ 13.0 13.1 "I Let People Do Their Jobs! ': A Conversation with Vince Fago—Artist, writer, and Third Editor-in-Chief of Timely/Marvel Comics". Alter Ego. 3 (11). Raleigh, North Carolina: TwoMorrows Publishing. November 2001. Archived from the original on November 25, 2009. ↑ Boucher, Geoff (September 25, 2009). "Jack Kirby, the abandoned hero of Marvel's grand Hollywood adventure, and his family's quest". Hero Complex (column), Los Angeles Times. Archived from the original on July 25, 2011. ↑ 15.0 15.1 Sanderson, Peter (2008). "1940s". In Gilbert, Laura. Marvel Chronicle A Year by Year History. London, United Kingdom: Dorling Kindersley. p. 19. ISBN 978-0-7566-4123-8. Joe Simon and Jack Kirby's assistant Stanley Lieber wrote his first story for Timely, a text story called 'Captain America Foils the Traitor's Revenge'. It was also his first superhero story, and the first work he signed using his new pen name of Stan Lee. ↑ Roy Thomas (November 13, 2018). "How Stanley Lieber Wrote His First Comics Story and Became 'Stan Lee'". ↑ 18.0 18.1 18.2 Thomas, Roy (2006). Stan Lee's Amazing Marvel Universe. New York: Sterling Publishing. ISBN 978-1-4027-4225-5. With the speed of thought, he sent his shield spinning through the air to the other end of the tent, where it smacked the knife out of Haines' hand!" It became a convention starting the following issue, in a Simon & Kirby's comics story depict the following: "Captain America's speed of thought and action save Bucky's life—as he hurls his shield across the room. ↑ Kupperberg, Paul (2006). The Creation of Spider-Man. New York, New York: Rosen Publishing. p. 12. ISBN 978-1-4042-0763-9. ↑ Brooks, Brad; Tim Pilcher (2005). The Essential Guide to World Comics. London, United Kingdom: Collins & Brown. p. 13. ISBN 978-1-84340-300-5. ↑ 22.0 22.1 Boatz, Darrel L. (December 1988). "Stan Lee". Comics Interview (64). Fictioneer Books. pp. 5–23. ↑ Conan, Neal (October 27, 2010). "Stan Lee, Mastermind of the Marvel Universe". Talk of the Nation. NPR. ↑ McLaughlin, Jeff; Stan Lee (2007). Stan Lee: Conversations. Jackson, Mississippi: University Press of Mississippi. p. 59. ISBN 978-1-57806-985-9. ↑ Collins, Shannon (June 28, 2017). "Stan Lee Proud to Be WWII Vet, Thanks Service Members for Serving". DoD News. Retrieved November 12, 2018. ↑ 26.0 26.1 26.2 Kaplan, Arie (2006). Masters of the Comic Book Universe Revealed!. Chicago Review Press. p. 50. ISBN 978-1-55652-633-6. ↑ 27.0 27.1 27.2 27.3 McLaughlin, Jeff; Stan Lee (2007). Stan Lee: Conversations. Jackson, Mississippi: University Press of Mississippi. p. 138. ISBN 978-1-57806-985-9. ↑ Noted comic-book writer Alan Moore described the significance of this new approach in a radio interview on the BBC Four program Chain Reaction, transcribed at "Alan Moore Chain Reaction Interview Transcript". Comic Book Resources. January 27, 2005. Archived from the original on November 8, 2010. ↑ Kimball, Kirk (n.d.). "Secret Origins of the Fantastic Four". Dial B For Blog. Archived from the original on September 20, 2015. ↑ DeFalco, Tom "1960s" in Gilbert (2008), p. 84: "It did not take long for editor Stan Lee to realize that The Fantastic Four was a hit...the flurry of fan letters all pointed to the FF's explosive popularity." ↑ DeFalco "1960s" in Gilbert (2008), p. 85: "Based on their collaboration on The Fantastic Four, [Stan] Lee worked with Jack Kirby. Instead of a team that fought traditional Marvel monsters however, Lee decided that this time he wanted to feature a monster as the hero." ↑ DeFalco "1960s" in Gilbert (2008), p. 88: "[Stan Lee] had always been fascinated by the legends of the Norse gods and realized that he could use those tales as the basis for his new series centered on the mighty Thor...The heroic and glamorous style that...Jack Kirby [had] was perfect for Thor." ↑ DeFalco "1960s" in Gilbert (2008), p. 91: "Set against the background of the Vietnam War, Iron Man signaled the end of Marvel's monster/suspense line when he debuted in Tales of Suspense #39...[Stan] Lee discussed the general outline for Iron Man with Larry Lieber, who later wrote a full script for the origin story." ↑ DeFalco "1960s" in Gilbert (2008), p. 94: "The X-Men #1 introduced the world to Professor Charles Xavier and his teenage students Cyclops, Beast, Angel, Iceman, and Marvel Girl. Magneto, the master of magnetism and future leader of the evil mutants, also appeared." ↑ DeFalco "1960s" in Gilbert (2008), p. 100: "Stan Lee chose the name Daredevil because it evoked swashbucklers and circus daredevils, and he assigned Bill Everett, the creator of the Sub-Mariner to design and draw Daredevil #1." ↑ DeFalco "1960s" in Gilbert (2008), p. 93: [Stan Lee] decided his new superhero feature would star a magician. Since Lee was enjoying his collaborations with Steve Ditko on The Amazing Spider-Man, he decided to assign the new feature to Ditko, who usually handled at least one of the backups in Strange Tales. ↑ DeFalco "1960s" in Gilbert (2008), p. 87: "Deciding that his new character would have spider-like powers, [Stan] Lee commissioned Jack Kirby to work on the first story. Unfortunately, Kirby's version of Spider-Man's alter ego Peter Parker proved too heroic, handsome, and muscular for Lee's everyman hero. Lee turned to Steve Ditko, the regular artist on Amazing Adult Fantasy, who designed a skinny, awkward teenager with glasses." ↑ DeFalco "1960s" in Gilbert (2008), p. 94: "Filled with some wonderful visual action, The Avengers #1 has a very simple story: the Norse god Loki tricked the Hulk into going on a rampage ... The heroes eventually learned about Loki's involvement and united with the Hulk to form the Avengers." ↑ "Marvel Bullpen Bulletins". reprinted on fan site. Archived from the original on May 2, 2010. Retrieved April 27, 2010. ↑ Thomas, Roy; Sanderson, Peter (2007). The Marvel Vault: A Museum-in-a-Book with Rare Collectibles from the World of Marvel. Philadelphia, Pennsylvania: Running Press. p. 98. ISBN 978-0-7624-2844-1. ↑ Manning, Matthew K. (2012). "1960s". In Gilbert, Laura. Spider-Man Chronicle Celebrating 50 Years of Web-Slinging. London, United Kingdom: Dorling Kindersley. p. 37. ISBN 978-0-7566-9236-0. [Stan Lee] knew that most readers tuned in every month for a glimpse of that side of Spider-Man's life as much as they did to see the wall-crawler battle the latest supervillain. ↑ Manning "1960s" in Gilbert (2012), p. 39: The Amazing Spider-Man #47 (April 1967) "Kraven's latest rematch with Spidey was set during a going-away party for Flash Thompson, who was facing the very real issue of the Vietnam War draft." ↑ Manning "1960s" in Gilbert (2012), p. 43: The Spectacular Spider-Man #1 (July 1968) "Drawn by Romita and Jim Mooney, the mammoth 52-page lead story focused on corrupt politician Richard Raleigh's plot to terrorize the city." ↑ Manning "1960s" in Gilbert (2012), p. 46: The Amazing Spider-Man #68 (January 1969) "Stan Lee tackled the issues of the day again when, with artists John Romita and Jim Mooney, he dealt with social unrest at Empire State University." ↑ David, Peter; Greenberger, Robert (2010). The Spider-Man Vault: A Museum-in-a-Book with Rare Collectibles Spun from Marvel's Web. Philadelphia, Pennsylvania: Running Press. p. 34. ISBN 978-0-7624-3772-6. Joseph 'Robbie' Robertson made his debut in The Amazing Spider-Man #51, in a manner that was as quiet and unassuming as the character himself. His debut wasn't treated like the landmark event that it was; he was simply there one day, no big deal. ↑ Cronin, Brian (September 19, 2010). "A Year of Cool Comics – Day 262". Comic Book Resources. Archived from the original on July 8, 2011. Retrieved September 29, 2010. ↑ DeFalco "1960s" in Gilbert (2008), p. 117: Stan Lee wanted to do his part by co-creating the first black super hero. Lee discussed his ideas with Jack Kirby and the result was seen in Fantastic Four #52. ↑ DeFalco "1960s" in Gilbert (2008), p. 131: "When Stan Lee was told to expand the Marvel line, he immediately gave the Surfer his own title...Since Jack Kirby had more than enough assignments, Lee assigned John Buscema the task of illustrating the new book." ↑ Daniels, p. 139: "Beautifully drawn by John Buscema, this comic book represented an attempt to upgrade the medium with a serious character of whom Lee had grown very fond." ↑ DeFalco "1960s" in Gilbert (2008), p. 137: "The Black Panther may have broken the mold as Marvel's first black superhero, but he was from Africa. The Falcon, however, was the first black American superhero." ↑ 54.0 54.1 54.2 van Gelder, Lawrence (February 4, 1971). "A Comics Magazine Defies Code Ban on Drug Stories; Comics Magazine Defies Industry Code". The New York Times. p. 37. ↑ Saffel, Steve (2007). "Bucking the Establishment, Marvel Style". Spider-Man the Icon: The Life and Times of a Pop Culture Phenomenon. Titan Books. p. 60. ISBN 978-1-84576-324-4. The stories received widespread mainstream publicity, and Marvel was hailed for sticking to its guns. ↑ "Comic Geek Speak: Episode 83". December 12, 2005. Retrieved September 15, 2015. ↑ "2008 National Medal of Arts – Stan Lee". National Endowment for the Arts. November 17, 2008. Archived from the original on August 26, 2009. Retrieved April 27, 2010. Biography linked to NEA press release "White House Announces 2008 National Medal of Arts Recipients", Archived August 13, 2009, at the Wayback Machine August 26, 2009. ↑ Comtois, Pierre; Montejo, Gregorio (July 16, 2007). "Silver Age Marvel Comics Cover Index Reviews". Samcci.Comics.org. Archived from the original on July 16, 2007. Retrieved February 6, 2011. ↑ Manning "1970s" in Gilbert (2012), p. 61: "Stan Lee had returned to The Amazing Spider-Man for a handful of issues after leaving following issue #100 (September 1971). With issue #110. Lee once again departed the title into which he had infused so much of his own personality over his near 10-year stint as regular writer." ↑ Saffel, "An Adventure Each Day", p. 116: "On Monday January 3, 1977, The Amazing Spider-Man comic strip made its debut in newspapers nationwide, reuniting writer Stan Lee and artist John Romita." ↑ Sanderson "1970s" in Gilbert (2008), p. 187: "[In 1978], Simon & Schuster's Fireside Books published a paperback book titled The Silver Surfer by Stan Lee and Jack Kirby...This book was later recognized as Marvel's first true graphic novel." ↑ DeFalco "1980s" in Gilbert (2008), p. 197: "With the help of artist John Buscema, [Stan] Lee created Jennifer Walters, the cousin of Bruce Banner." ↑ 64.0 64.1 64.2 64.3 "Stan Lee Sues Marvel…And Wins!". Bob Batchelor. Retrieved 2018-11-14. ↑ Dean, Michael (August 2005). "How Michael Jackson Almost Bought Marvel and Other Strange Tales from the Stan Lee/Peter Paul Partnership" (270). excerpt The Comics Journal. Archived from the original on May 16, 2008. ↑ "Stan Lee Media CEO Kenneth Williams Accused of Shareholder Fraud and Libel in Court Filing By Former Stan Lee Media Executive: Accusations Against Peter Paul Retracted and Corrected in Court Filing". Freund & Brackey LLP press release. May 7, 2001. Archived from the original on August 1, 2011. ↑ "Stan Lee, legendary Marvel Comics creator, is dead at 95". Retrieved 2018-11-14. ↑ Greenberger, Robert (July 11, 2012). "Enter Stan Lee's World of Heroes". ComicMix. Archived from the original on December 26, 2013. ↑ Sacks, Jason (n.d.). "Peter David and Jace Hall Join the World of Heroes". Comics Bulletin. Archived from the original on December 26, 2013. Retrieved December 16, 2012. ↑ Van, Alan (July 12, 2012). "SDCC: 'Stan Lee's World of Heroes' YouTube Channel". NMR. Archived from the original on March 12, 2014. ↑ Seifert, Mark (July 13, 2012). "The Stan Channel: Stan Lee, Peter David, Mark Hamill, Adrianne Curry, America Young, And Bonnie Burton On Stan Lee's World Of Heroes". BleedingCool.com. Archived from the original on January 29, 2013. ↑ "Disney Publishing Worldwide Announces New Zodiac-Based Book with Comics Legend Stan Lee". Press release. November 2, 2013. Archived from the original on November 6, 2013. https://web.archive.org/web/20131106030052/https://finance.yahoo.com/news/disney-publishing-worldwide-announces-zodiac-022000970.html. ↑ LeBlanc, Sarah (July 22, 2016). "Stan Lee puts philosophical spin on comic book adventure". Philadelphia Daily News. Archived from the original on July 30, 2016. Retrieved July 30, 2016. ↑ Niu, Mark (July 24, 2016). "Comic book legend Stan Lee treated like royalty at Comic-Con". China Central Television. Archived from the original on July 26, 2016. Retrieved July 30, 2016. ↑ "2017 Independent Publisher Book Awards". Independent Publisher Book Awards. Archived from the original on April 8, 2017. Retrieved April 9, 2017. ↑ Chris Hewitt; Al Plumb. "Stan Lee's Marvellous Cameos – Now With Even More Cameos". Empire. Retrieved December 7, 2017. ↑ "Spider-Man: Homecoming (2017) — From 'X-Men' to 'Spider-Man': 35 of Stan Lee's Most Memorable Cameos". The Hollywood Reporter. Retrieved December 7, 2017. ↑ Bankhurst, Adam (November 12, 2018). "Stan Lee Already Filmed His Avengers 4 Cameo". IGN. Retrieved November 12, 2018. ↑ Lee in "Is there a God?". The A.V. Club. October 9, 2002. Archived from the original on March 1, 2009. Retrieved February 6, 2013. ↑ Lewine. "Image 2". Archived from the original on April 24, 2009. Retrieved April 27, 2010. ↑ "Stan & Joan Lee's Love Story". Daily Entertainment News. Retrieved June 30, 2017. ↑ Lewine. "Images 4–5". Archived from the original on April 24, 2009. Retrieved April 27, 2010. ↑ Lewine. "Images 6–7". Archived from the original on April 24, 2009. Retrieved April 27, 2010. ↑ Lewine. "Image 10". Archived from the original on April 24, 2009. Retrieved April 27, 2010. ↑ Lewine. "Image 11". Archived from the original on April 24, 2009. Retrieved April 27, 2010. ↑ "Comic Book Legend Stan Lee Gets a Pacemaker". City News Service. September 28, 2012. Archived from the original on February 6, 2013. Retrieved February 6, 2013 – via Beverly Hills Courier. ...the procedure performed last week. ↑ POW! Entertainment (September 28, 2012). "Pow! Entertainment Releases a Message from Its Chairman Stan Lee". Press release. Archived from the original on January 22, 2013. https://web.archive.org/web/20130122112217/http://www.powentertainment.com/stanleemessage.html. Retrieved February 6, 2013. ↑ Lewis, Andy (July 6, 2017). "Joan Lee, Wife of Marvel Comics Legend Stan Lee, Dies at 95". The Hollywood Reporter. Archived from the original on July 31, 2017. ↑ Baum, Gary (April 10, 2018). "Stan Lee Needs a Hero: Elder Abuse Claims and a Battle Over the Aging Marvel Creator". The Hollywood Reporter. Retrieved November 12, 2018. ↑ Widdicombe, Ben (April 13, 2018). "Is Stan Lee Being Held Prisoner by Real-Life Villains?". The New York Times. Retrieved November 12, 2018. ↑ Kandell, Jonathan; Webster, Andy (November 12, 2018). "Stan Lee Is Dead at 95; Superhero of Marvel Comics + Video (05:26)". The New York Times. Retrieved November 13, 2018. ↑ Lowry, Brian (November 12, 2018). "Stan Lee, Marvel Comicbook Legend, Dies at 95". Variety. Retrieved November 12, 2018. ↑ Paulson, Ken (November 12, 2018). "Superhero Stan Lee fought for justice and diversity with relatable comic book characters". USA Today. Retrieved November 12, 2018. ↑ "Marvel Creator Stan Lee's Death Certificate Lists Heart Failure as Cause of Death". TMZ. Retrieved November 27, 2018. ↑ "Marvel Legend Stan Lee Has Passed Away". Observer. November 12, 2018. Retrieved November 13, 2018. ↑ "Inkpot Award". San Diego Comic-Con. 2016. Archived from the original on January 29, 2017. ↑ "Will Eisner Hall of Fame". The Will Eisner Comic Industry Awards. 2014. Archived from the original on January 10, 2014. ↑ Curry, Stormy (October 31, 2013). "Stan Lee: It's All In The Cameos With Marvel Movies". KTTV. Archived from the original on March 13, 2014. ↑ Garreau, Joel (November 18, 2008). "Stan Lee and Olivia de Havilland Among National Medal of Arts Winners". The Washington Post. Archived from the original on February 6, 2016. Retrieved February 6, 2016. ↑ "2009 Hugo Awards". World Science Fiction Society. Archived from the original on May 7, 2011. Retrieved April 19, 2010. ↑ "TV: Video Highlights from the 2009 Spike TV Scream Awards". Bloody-disgusting.com. Archived from the original on October 10, 2012. Retrieved April 27, 2010. ↑ Simpson, David (January 4, 2011). "Video: Stan Lee Picks Up 2,428th Star on Hollywood Walk of Fame". The Hollywood Reporter. Archived from the original on June 2, 2012. Retrieved September 14, 2012. ↑ "Stan Lee to Receive 2012 Producers Guild Vanguard Award". The Hollywood Reporter. November 9, 2011. Archived from the original on May 24, 2012. Retrieved March 4, 2012. ↑ "2016 Awards". National Academy of Video Game Trade Reviewers. Archived from the original on August 29, 2017. This page was last changed on 2 March 2019, at 02:24.